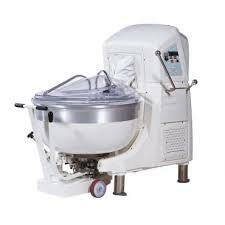 Fork mixers are very popular in France and Italy, and gaining a following in the North America, due to their gentle folding action as they mix dough. The gently curved bowl is in a fixed position, and instead of a hook, a fork mixing implement angled into the bowl plunges into and gently turns the dough. The French versions, such as VMI, are somewhat faster than the Italian (Esmach), but both are very slow compared to spiral mixing speeds. The slow speed and gentle, folding action don’t generate appreciable friction. Therefore, dough can be mixed longer for maximum gluten development. 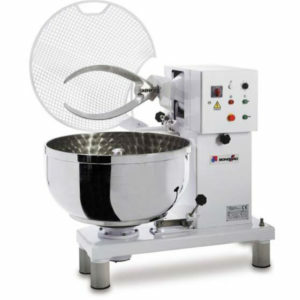 The more complex design of the fork mixer and the lower volume of production by manufacturers tend to make this mixer more expensive than its spiral counterpart. Still those who have used fork mixers swear by them, including a growing number of bread and pizza bakers in North America. TMB Baking offers models from both VMI and Esmach and we would be happy to discuss their pros and cons with you.